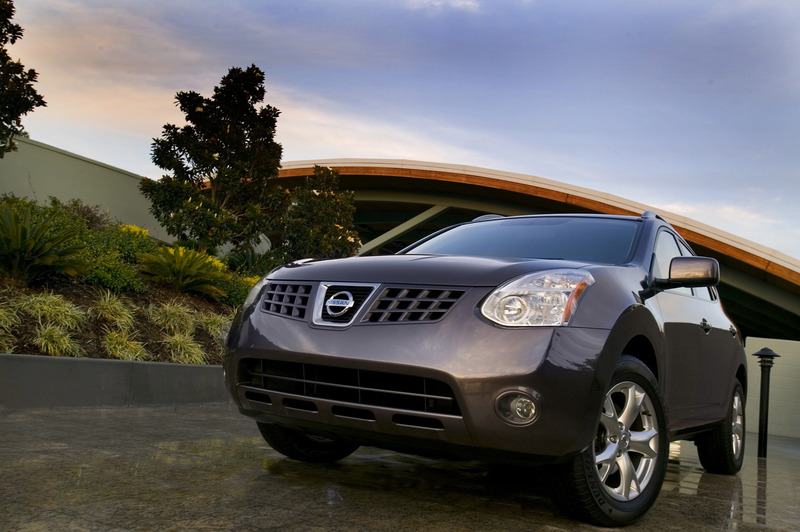 The Nissan Rogue crossover SUV enters its third year of production in 2010, once again offering a unique combination of sporty styling, engaging performance, versatility, safety and traditional Nissan value – including a new high-content 360° Value Package. The award-winning Rogue continues to satisfy both the functional needs of the buyers and their emotional needs – including the versatility provided by a large 58 cubic feet of cargo space. 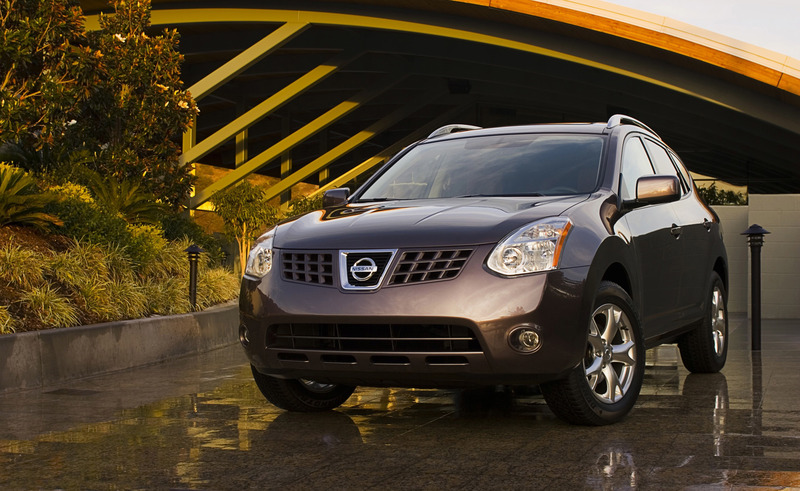 The biggest news for 2010 is the addition of a new Nissan Rogue Krom™ edition, which is scheduled to go on sale at Nissan dealers nationwide in December 2009. The new Rogue Kr?m edition is designed to offer a unique dimension to traditional compact sport utility vehicles with its aggressive sport styling, exclusive 17-inch wheels and a center-exit sport-tuned exhaust. The limited production Rogue Kr?m edition is available in both front-wheel and all-wheel drive configurations and in just three exterior colors – Venom Red, Wicked Black and Gotham Gray. Built on the solid foundation of the Rogue S, the Krom edition adds 17-inch brilliant finish aluminum-alloy wheels with P225/60R17 Continental Conti 4x4 Contact or Dunlop ST20 Grandtrek tires and a unique grille embedded in the aggressive front fascia with integrated fog lights. In the rear, Rogue Krom edition includes a boldly styled sport fascia with integrated center-mounted exhaust, a body-colored rear spoiler and rear privacy glass. Body-colored power outside mirrors, a Krom emblem and steering wheel-mounted audio controls complete the Krom equipment modifications. "The new Krom edition is a great addition to the Rogue lineup, offering a provocative exterior designed to stand out from the crowd of vanilla compact SUVs," said Al Castignetti, vice president and general manager, Nissan Division, Nissan North American, Inc. 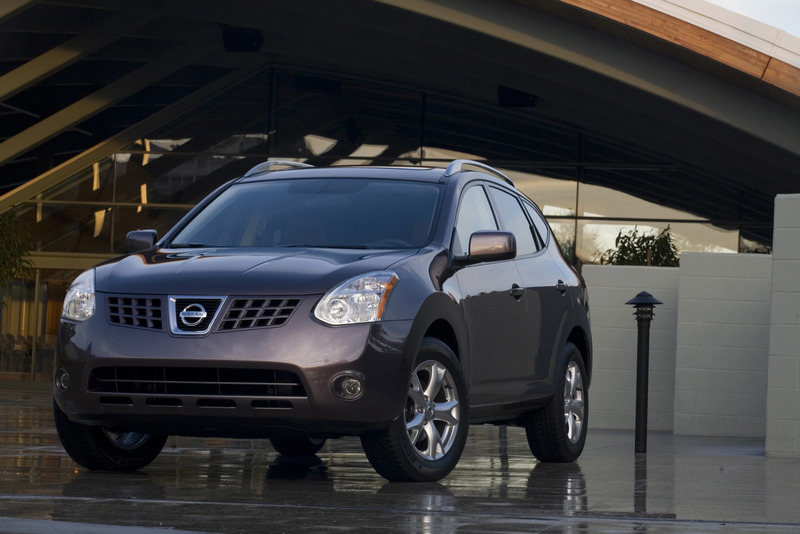 The 2010 Rogue is also available in Rogue S and Rogue SL models. 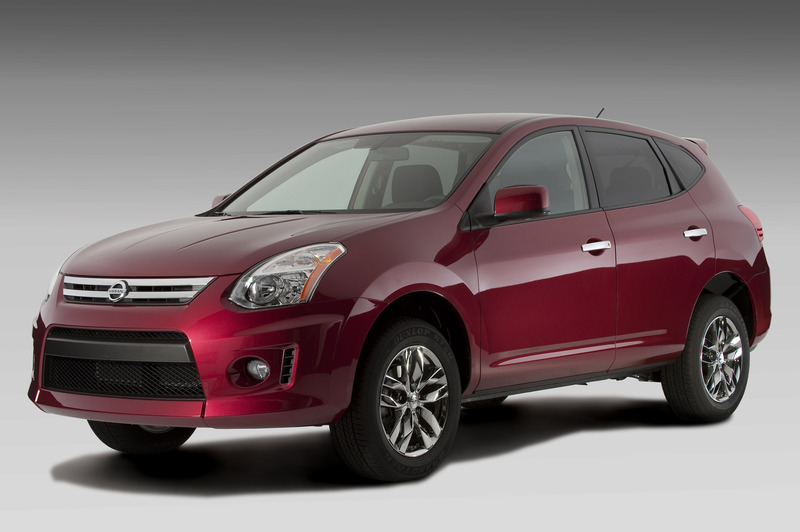 All three Rogue offerings come equipped with a standard 170-horsepower 2.5-liter 4-cylinder engine, Nissan's advanced Xtronic CVT™ (Continuously Variable Transmission), Vehicle Dynamic Control (VDC) and 4-wheel disc brakes with Anti-lock Braking System (ABS). Both S and SL models are available with an intuitive All-Wheel Drive system. The new 360° Value Package includes 16-inch aluminum-alloy wheels, privacy glass, integrated rearview mirror rearview monitor, auto-dimming rearview mirror, a rear spoiler and chrome grille. Rogue's interior includes a driver-oriented cockpit, available leather-appointed seating surfaces, heated seats and 6-way power driver's seat. Utility is enhanced by numerous convenient storage and ultra-functionality features, including an oversized glove compartment, a large center console and an innovative rear cargo organizer. Available technology features include Nissan Intelligent Key™, Bluetooth® Hands-free Phone System, XM® Satellite Radio (XM® subscription required, sold separately) and a powerful Bose®–developed audio system with 7 speakers with Nd® Richbass® woofer, AUX input and MP3 playback. Rogue also offers a long list of standard safety features, including front seat-mounted side impact supplemental air bags and roof-mounted curtain side impact supplemental air bags with rollover sensor for improved front and rear-seat outboard occupant head protection. "Rogue's original concept of providing great driving performance, SUV versatility and good fuel efficiency in one high-value package resonates even more today with buyers looking for a high-style vehicle that can do it all," said Castignetti. "The addition of the new 360° Value Package is the proverbial ‘frosting on the value cake,' adding some of our most popular features at a great price." Rogue's exterior is designed to present an image of modern sophistication – both aggressive and sporty. Its dramatic styling includes dynamically arched forms and powerful rear shoulder lines. Rogue features available Xenon headlights, available power sliding glass moonroof with dark gray glass, and an available roof rail system with detachable crossbars (accessory). 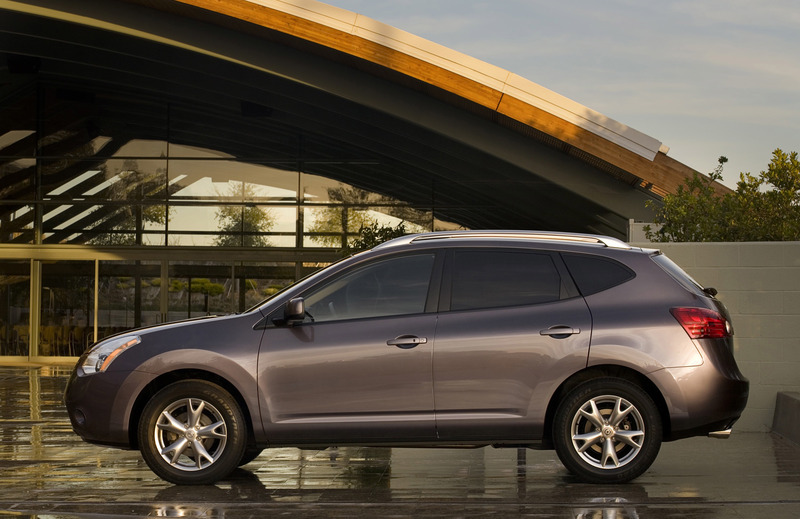 Chrome door handles are now standard on all 2010 Rogue models. The Rogue Krom edition includes an unique grille embedded in the aggressive front fascia with integrated fog lights, a boldly styled rear sport fascia with integrated center-exit exhaust, integrated body-colored rear spoiler and body-colored power outside mirrors. 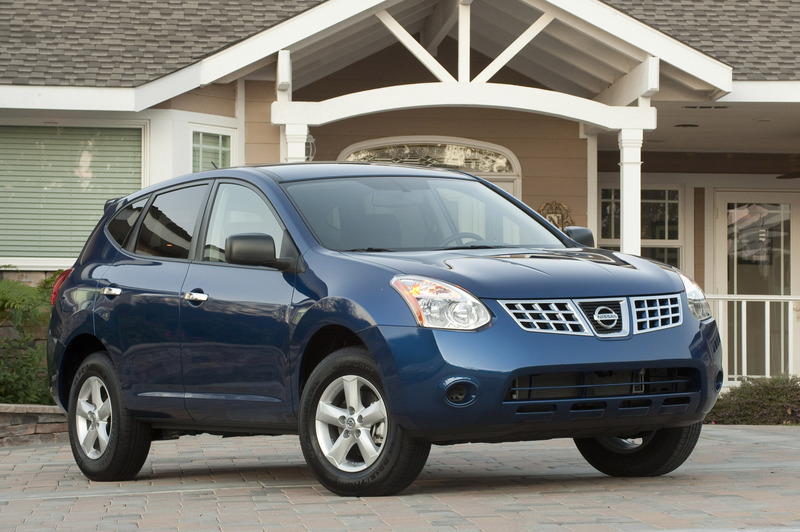 Every Rogue is built on Nissan's proven "C" platform, which provides high body stiffness with extensive use of high-strength steel utilized to reduce body weight. Rogue features a 105.9-inch wheelbase and 182.9-inch overall length – among the longest in class, compared with leading small crossover competitors – providing ample rear seat proportions and one of the longest interior lengths. The body also features large front door openings for easy ingress and egress. Rogue's interior, like its exterior, is designed to stand out in class with its sophisticated integration of a cockpit-like driver's space and exceptional utility. The driver's seat position offers excellent visibility, enhanced by an available seat lifter with up to two inches of seat height adjustability. Rogue's instrument panel layout and steering wheel are designed for easy readability and operation while also providing a sporty look and feel. An available drive computer (standard on SL) includes displays for distance-to-empty, average fuel consumption, average speed, elapsed time and outside temperature. Available steering wheel-mounted controls include audio, Bluetooth® Hands-free Phone System and cruise control (cruise control is standard on all models). Leather-appointed seating surfaces and heated front seats and mirrors are also available, along with a fold-down front passenger seat (standard on SL) – which allows more than 8.5 feet of front-to-rear cargo space for carrying long items such as wood or ladders. A rear 60/40 split-fold bench seat, oversize glove compartment, and versatile center console all contribute to Rogue's impressive functionality. Rogue's roomy cargo area has a number of available utility features, including a unique cargo organizer (available on SL only). When needed, the organizer pops up – with a one-touch open button – from its hidden space below the flat cargo floor. A portion of the cargo floor snaps into a vertical position, revealing a flat recessed space with removable, vertical cargo nets. The system helps prevent items such as sports equipment and grocery bags from rolling loose around the cargo area while driving. Rogue also features a washable, removable tray that fits below the cargo area floor to hold wet or dirty gear and tools and a rear tonneau cover to keep luggage and other items out of sight. Rogue's everyday utility features also include a variety of cupholders, memo/pen holder, coin holder and cell phone/sunglass holders. Among the advanced technology features available on Rogue are a Nissan Intelligent Key™ and a powerful Bose®-developed audio system with 6CD in-dash changer, 7 speakers with Nd® Richbass® woofer with MP3 capability and XM® Satellite Radio (XM® subscription required, sold separately). Also available is a Bluetooth® Hands-free Phone System. While maintaining its functionality as a family vehicle, Rogue's creators also recognized the target buyers' desires for a higher level of acceleration, handling and fun-to-drive attributes than offered by traditional small crossover SUVs. Rogue delivers on this promise with an advanced drivetrain anchored by its powerful 2.5-liter engine, 4-wheel independent suspension and refined, intuitive All-Wheel Drive system. Rogue's standard QR25DE 2.5-liter DOHC 16-valve inline 4-cylinder is rated at 170 horsepower and 175 lb-ft torque, tuned to provide ample torque in the low-to-mid rpm range for smooth, powerful acceleration and quick initial response from a standing start. The engine features an aluminum block, reduced piston and piston ring friction and increased thermal efficiency (over the previous generation 2.5-liter engine design), 9.6:1 compression ratio, and large diameter intake port and exhaust manifold. 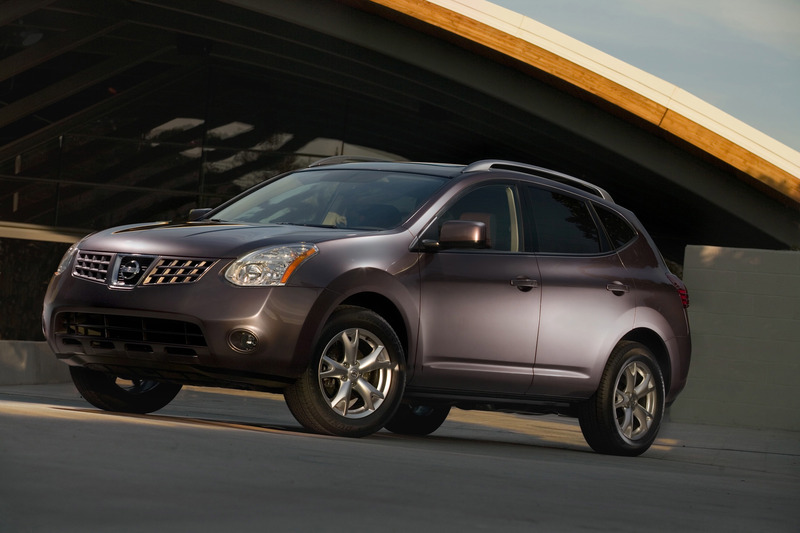 Every Rogue comes with a standard Nissan Xtronic CVT™, combining smooth, linear and responsive acceleration feel with high-efficiency operation. 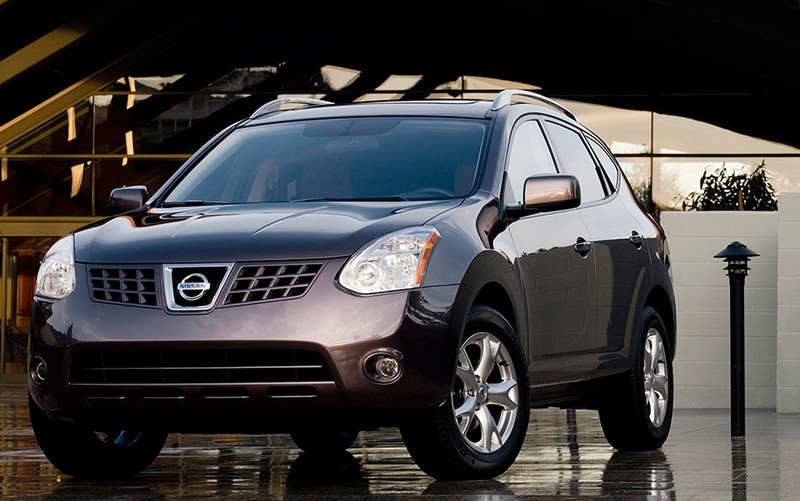 Rogue's CVT utilizes adaptive logic control and a high-speed central processing unit. Its advanced shift control offers the optimal shift pattern according to the driving situation and driver's demands, using input from driver operation, vehicle speed, road gradient, turning condition and acceleration force to adjust shifting patterns accordingly. Rogue fuel economy is rated at 22 mpg City/27 mpg Highway for 2-wheel drive models and 21 mpg City/26 mpg Highway for all-wheel drive models. 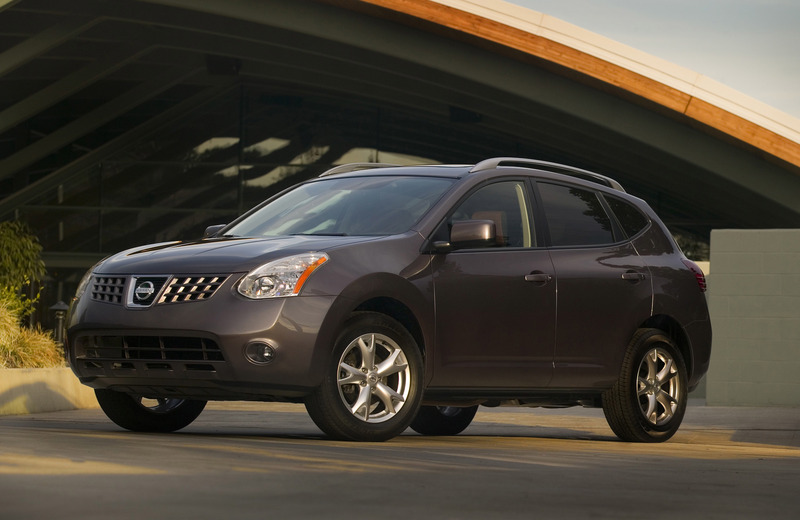 Rogue AWD models feature an advanced, intuitive All-Wheel Drive system with yaw moment control or front-wheel drive. The system provides stable starts on dry or slippery roads and excellent all-weather performance and traction. 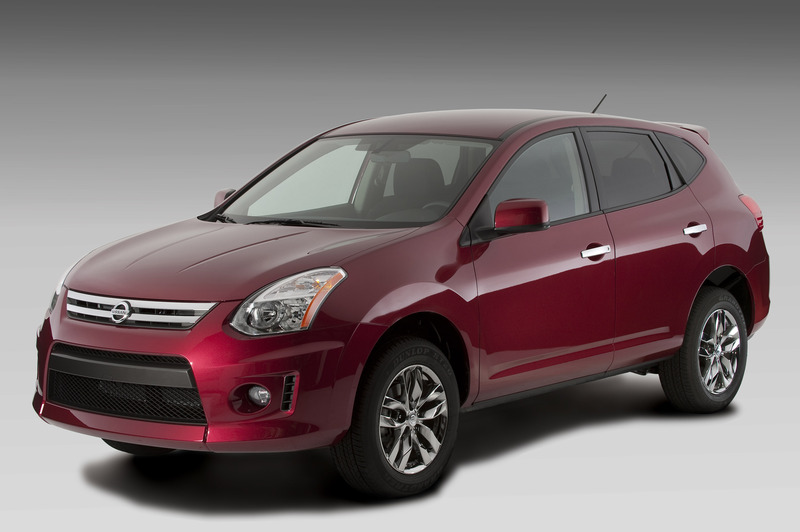 Every Rogue also features standard Vehicle Dynamic Control (VDC) with Traction Control System (TCS). Rogue's standard 4-wheel independent suspension provides a balance of ride comfort and driving stability. The front suspension includes subframe-mounted independent struts with coil springs, high-performance shock absorbers with rebound springs, and a stabilizer bar. The rear independent multi-link suspension includes aluminum-alloy upper links, high-performance shock absorbers with rebound springs and stabilizer bar. The rear suspension design allows maximum luggage space (versus a rear strut design), as well as driving stability. Responsive steering is provided by an Electric Power-assisted Steering (EPS) system. Every Rogue also comes equipped with standard power-assisted front and rear vented disc brakes with standard Anti-lock Braking System (ABS) with Electronic Brake force Distribution (EBD) and Brake Assist (BA). Rogue S models come with 16-inch steel wheels and P215/70R16 tires, while 17-inch aluminum-alloy wheels with P225/60R17 tires are standard on Rogue SL and the Rogue Kr?m edition. 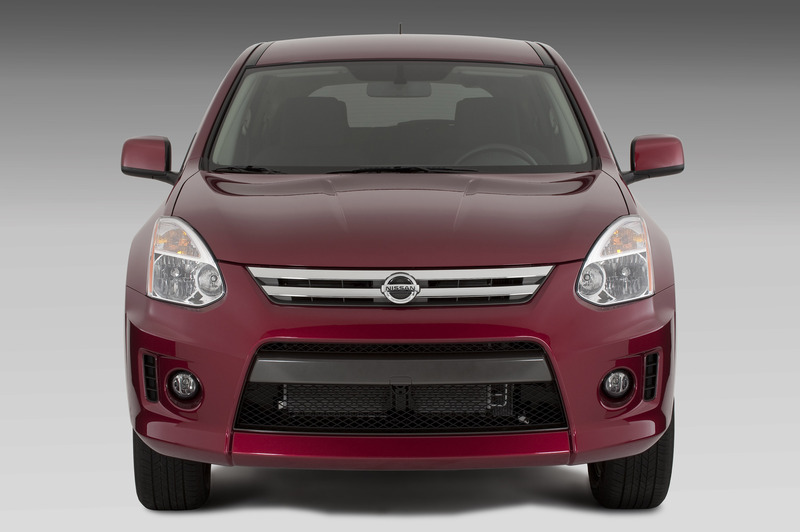 Standard safety features include the Nissan Advanced Air Bag System (AABS) with dual-stage supplemental front air bags with seat belt and occupant classification sensors; front seat-mounted side impact supplemental air bags; roof-mounted curtain side impact supplemental air bags with rollover sensor for improved front and rear-seat outboard occupant head protection; front seat Active Head Restraints; 3-point front/rear seatbelts with pre-tensioners, load limiters and adjustable upper anchors for front seating positions and LATCH System (Lower Anchors and Tethers for CHildren). 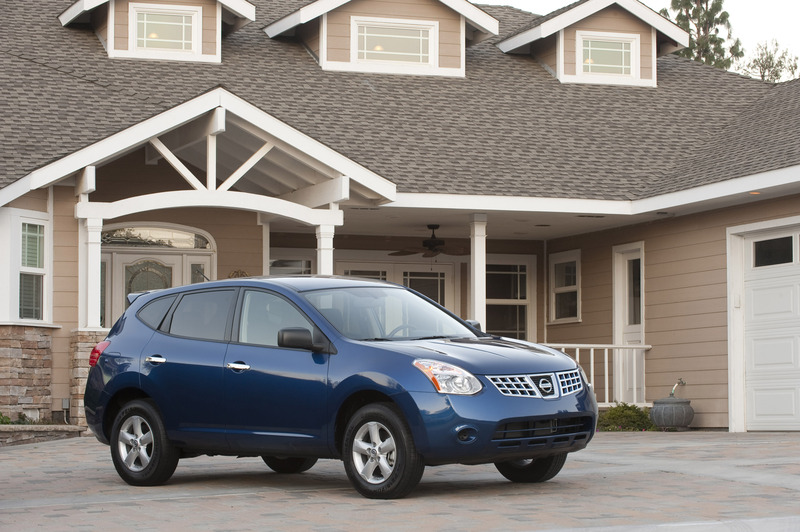 Every Rogue also offers child safety rear door locks; Zone Body construction featuring front and rear crumple zones and occupant zone; Nissan Immobilizer system and anti-theft alarm system; and Tire Pressure Monitoring System (TPMS). A number of option packages are offered in 2010, including the new 360° Value Package with 16-inch aluminum–alloy wheels, privacy glass, integrated rearview mirror rearview monitor, rear spoiler, chrome grille overlay. Also available is a Premium Package with Bose® premium audio system, XM® Satellite Radio (XM® subscription required, sold separately), foldable cargo organizer, tonneau cover, front fog lights, Bluetooth® Hands-free Phone System, Nissan Intelligent Key™, Xenon headlights (AWD only) and more; and a Leather Package with leather-appointed seating surfaces, steering wheel and shift knob; heated front seats and mirrors; power 6-way driver's seat, one-touch up/down driver's window and more. A power glass moonroof is also offered.